Want a deeper experience in the Bible? Our Mighty in the Word study course is an advanced discipleship program that explores 5 key ways to internalize Scripture, including listening, reading, study, memorization, and application. In addition to valuable practical suggestions, each lessons also introduces a new Bible study approach to help sharpen your study skills. 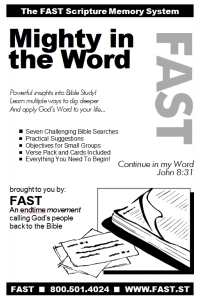 An important series for those who want to become mighty in the Word!